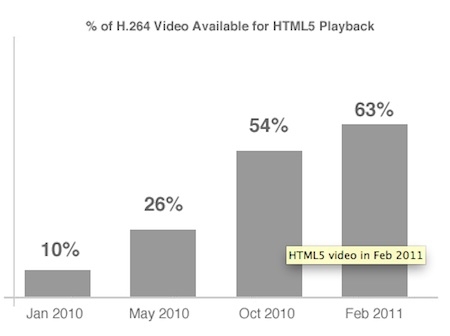 "A new study shows that nearly two thirds of all streaming Web video is HTML5 compatible. In other words, Adobe Flash is no longer needed for a majority of Web content." HTML5-compatible video aka H.264 is now comprising more than 60% of the streaming video on the Internet. MeFeedia indexed approximately 30 million videos from over 33,000 sites to come to this conclusion. Amazingly, in less than a year, over 50% of the video out there has dropped Flash as a requirement. I find I don't miss it most of the time on my laptop using Safari, but If there is something I want to see I just switch to Chrome. How about you, do you use Flash or do you find that it isn't that big of a deal not to have it installed on Safari?